Happy New Year, my dear friends! I'd like to kick off my first post of the year with this gorgeous Christmassy dish that I had made couple of weeks ago. 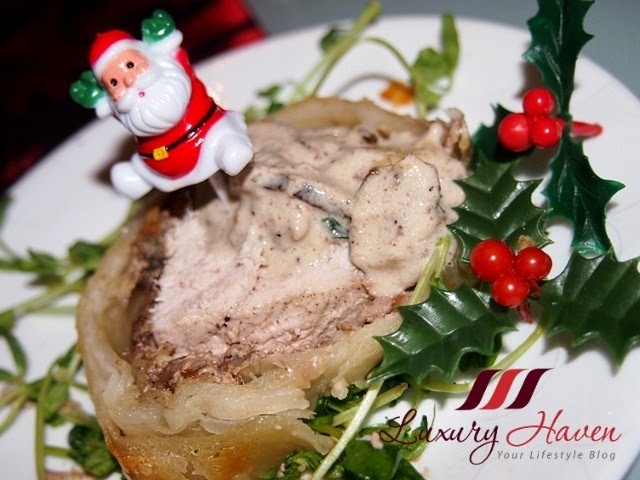 Here's celebrating 2014, and the twelve days of Christmas with this Festive Pork Wellington Wrapped In Foie Gras Recipe! 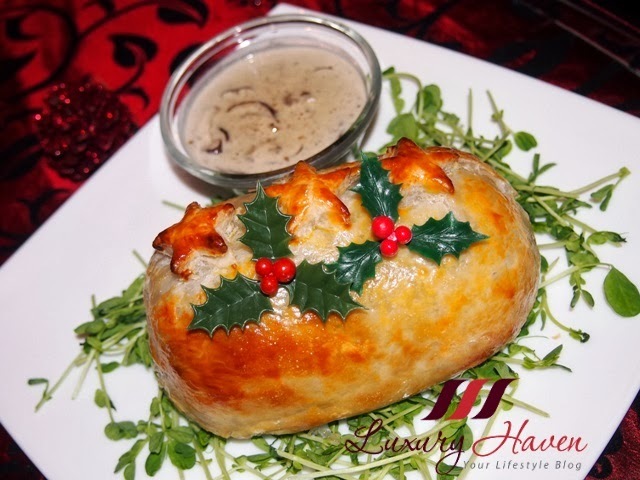 During my Food Tasting at Taratata Bistrot with hubby few weeks back, we were introduced to Beef Wellington and I knew at that instance I just gotta try making this fanciful dish. Although the beef at #Taratata was a tat too rare for our liking, I was fascinated by the layering using pate and mushrooms. 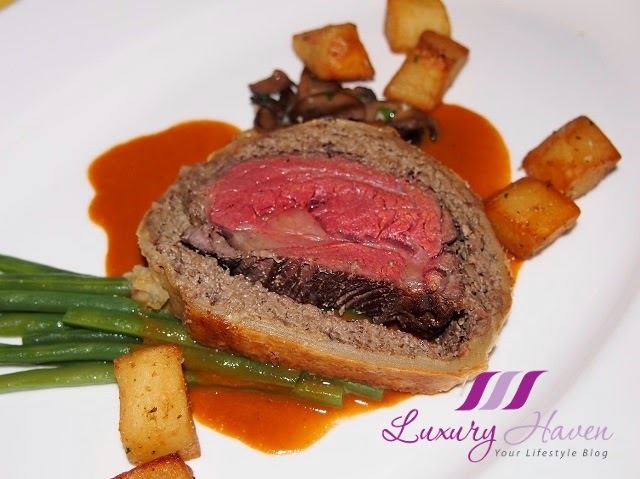 Since then, I've been thinking how to recreate the Beef Wellington. Over at Taratata, they used mushrooms and pork liver to wrap the beef. 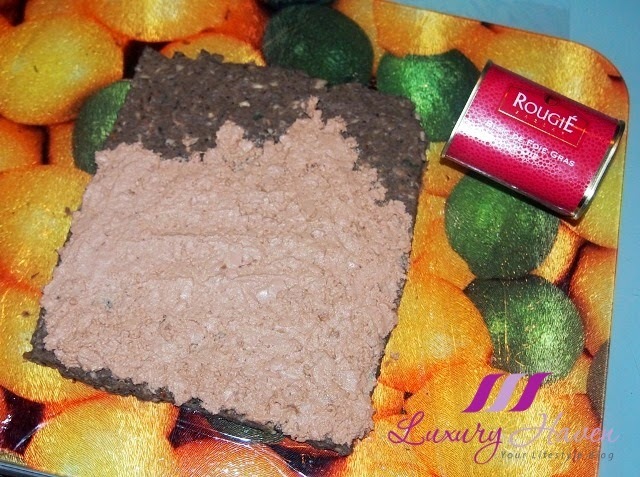 Thanks to my BFF who bought me my favourite #Fauchon and #Rougie Foie Gras from Paris some time ago, I decided to experiment with the Rougie Goose Liver. 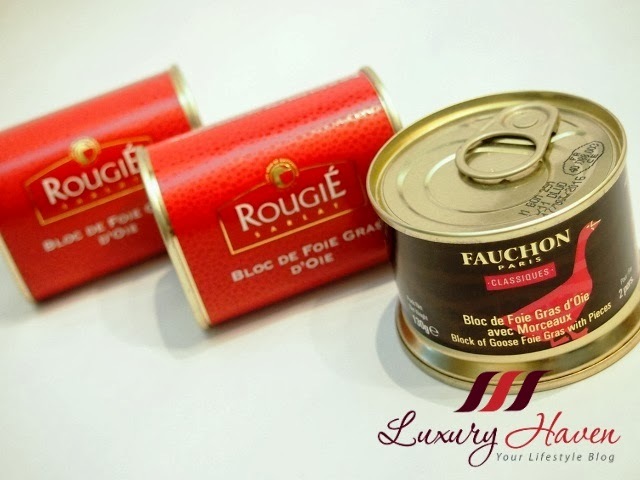 Not that I've any choice, that was the last can of Foie Gras left. Hahaha! It was a bold challenge, but what's better than using the gifts that my good friend had bought for me, to make her a dish? Since Elena doesn't like beef, I was pondering if I should substitute with chicken or pork. Hubby thought using chicken breast may turn out tough, so I decided to try pork instead. For those who don't take pork, use any meat you like. This is a gorgeous dish that's set to impress. Imagine your meat wrapped in mushrooms, foie gras, and lastly with crispy flaky puff pastry. I also made a Black Pepper Mushroom Sauce to go with it. I'm really glad it turned out well; Elena and her sis commended that it was really tasty. But there was one hiccup though. I couldn't do a nice cut. As I used puff pastry to wrap the pork, the flaky pastry broke with each slice I cut. I couldn't figure what went wrong. Should I blame my knife, my cutting or wrapping skills? 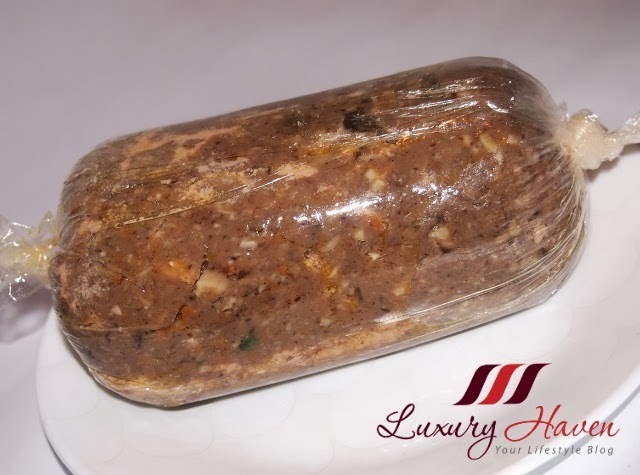 I wrapped my pork very tightly, and even refrigerated to set the shape. Hubby said maybe I should use short crust pastry instead, but I clearly remember Taratata used puff pastry cause their Beef Wellington was flaky. Any idea? Tips for me? 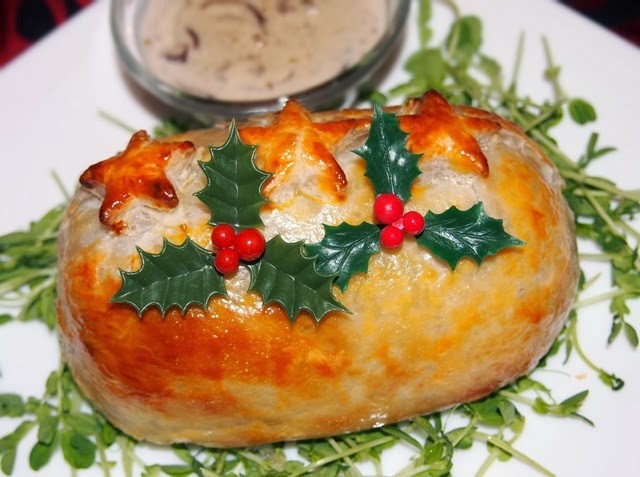 Nonetheless, the Christmas Pork Wellington was real tender and tasty. Not too bad for first attempt, eh? Besides, it's visually appealing, isn't it? 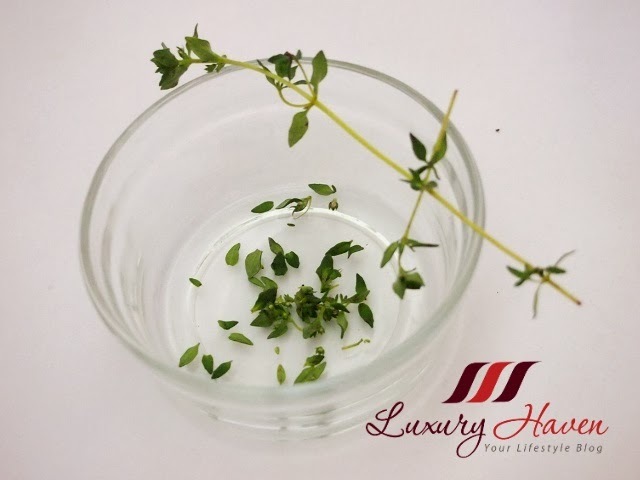 Remove mushrooms stems. Cut away the ends and scrap off outer layer. Rinse and cut the mushrooms into smaller pieces for easy blending. Add mushrooms, salt and pepper, to blend into a puree. Scoop out 1 tbsp and keep aside to make a sauce later. Remove thyme leaves from stalk. Heat 1 tsp of oil and sautéed garlic. Add mushrooms, thyme leaves, and fry the mixture for about 5 mins. 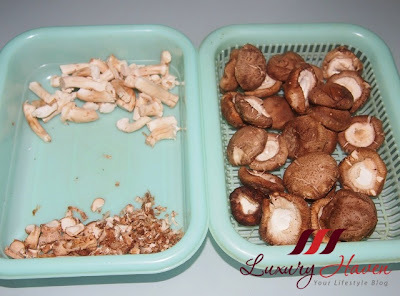 Important: make sure mushroom mixture is dry. Remove and mix with grounded peanuts for more flavours. Season pork with pepper and salt. Heat another tsp of oil and sear the seasoned pork on all sides until it's brown to seal in the juices. Remove and allow to cool. Roll out a generous length of cling film, spread mushroom mixture to form a rectangular shape. Top with foie gras. Make sure you cover the entire area. 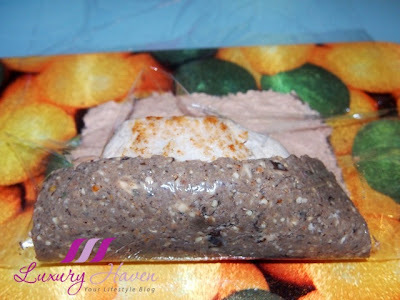 Place the pork fillet in the middle, and roll the foie gras and mushrooms mixture into a tight roll. Twist the ends to secure the cling wrap. 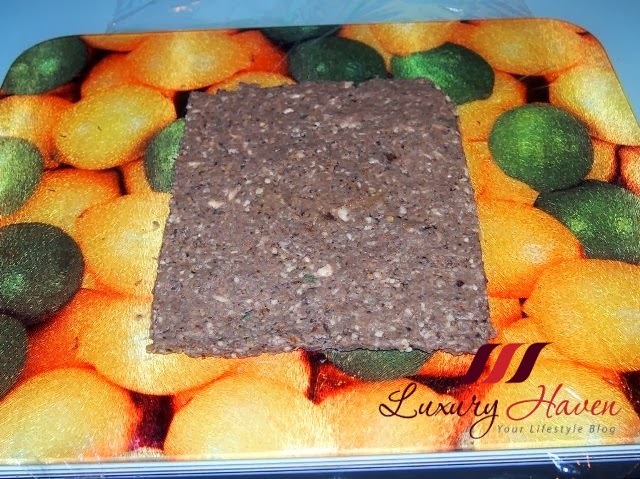 Refrigerate for about 15 mins to allow the shape to set. 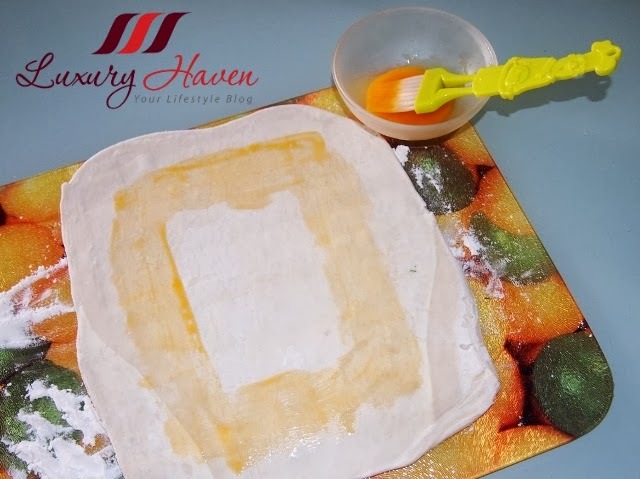 Roll out the pastry thinly, and egg wash the edge of the pastry. Unwrap the meat from the cling film, and place the pork in the middle. 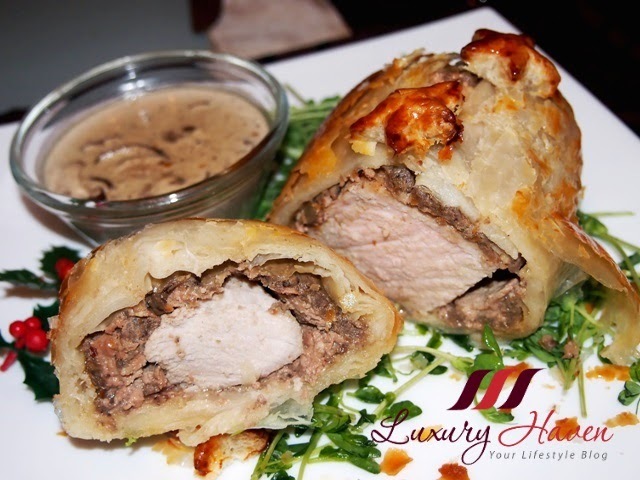 Wrap the pork in the pastry, cut off any excess and tuck in neatly. 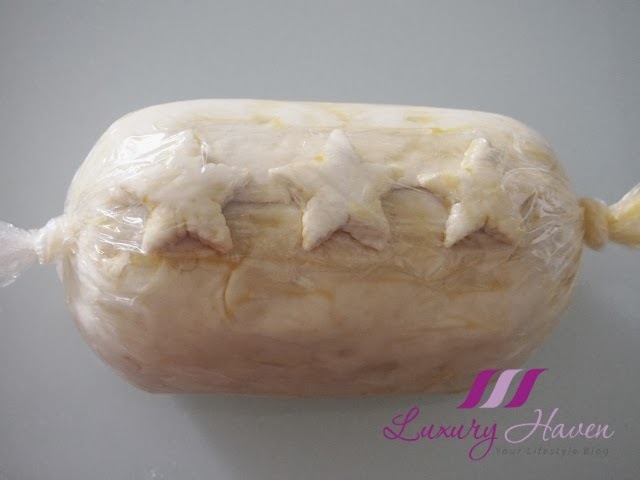 Next, wrap it tightly in cling wrap and refrigerate for 5 mins. Use the excess pastry to make patterns. I used a cutter to cut out some stars to place on top of the pastry to give it some festive cheer. Remove wrap and brush it with egg yolk. Sprinkle with salt. Pre-heat the oven to 250° C, and bake the #wellington for about 30 min. Use a satay stick to pierce through pork to check if it's thoroughly cooked. If there's resistance, bake for another 5 mins. * Don't bake for too long, or pork will be tough. Rest for about 10 mins before slicing. 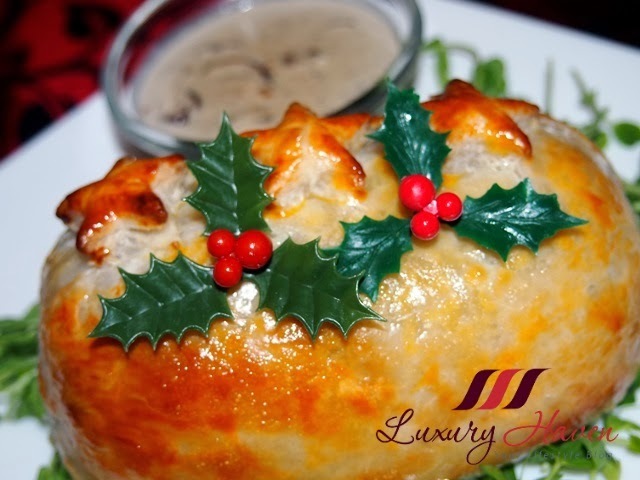 Serve your succulent Christmas Pork Wellington with the yummy Homemade Mushroom Sauce! 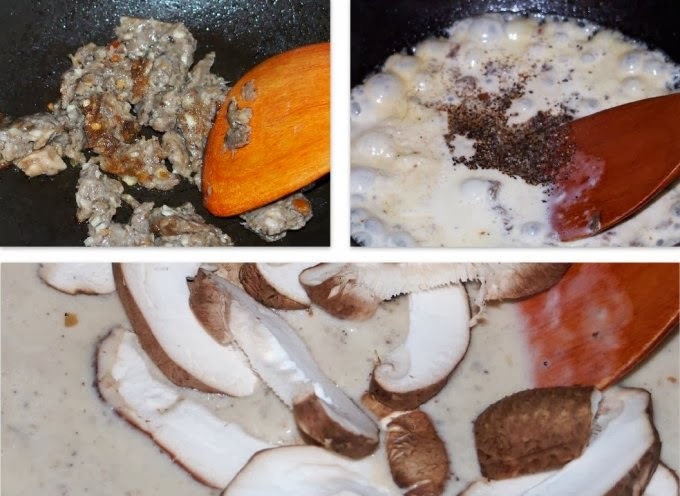 To make the Black Pepper Mushroom Cream Sauce, simply sautéed the blended mushrooms. 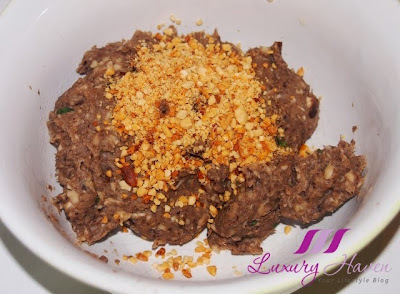 Next, add black pepper and #Bulla Cream to cook for about 2 mins on low fire. Lastly, add sliced mushrooms, and mix well. 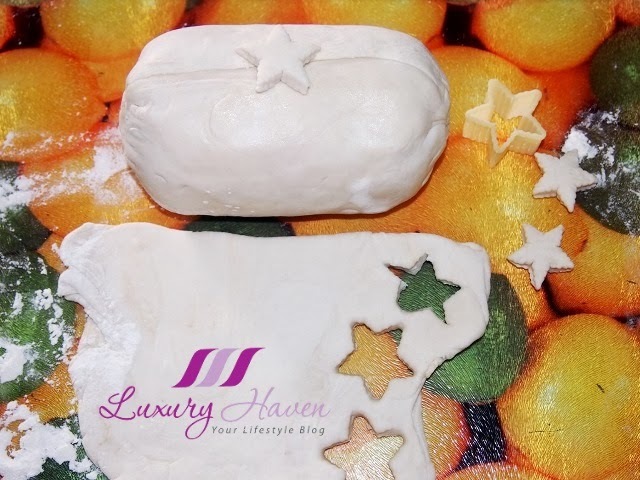 Stir in cornstarch and serve with your Pork Wellington. If you've excess pastry skin, don't throw them away. 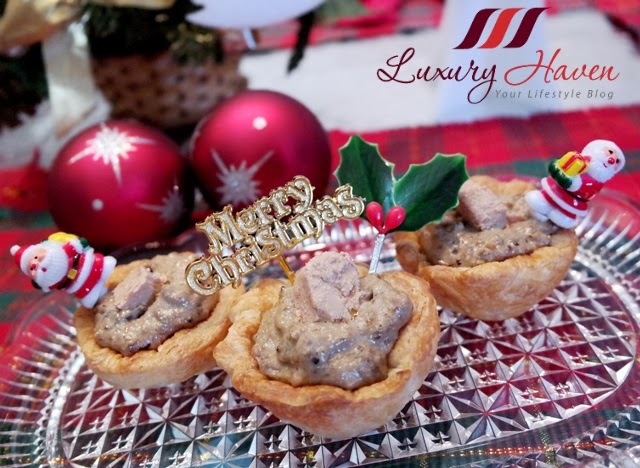 I enjoy eating Vol au Vent, so I used the excess to make some shells for my excess foie gras mushroom fillings. I kept them in an air-tight container and put it in the refrigerator. 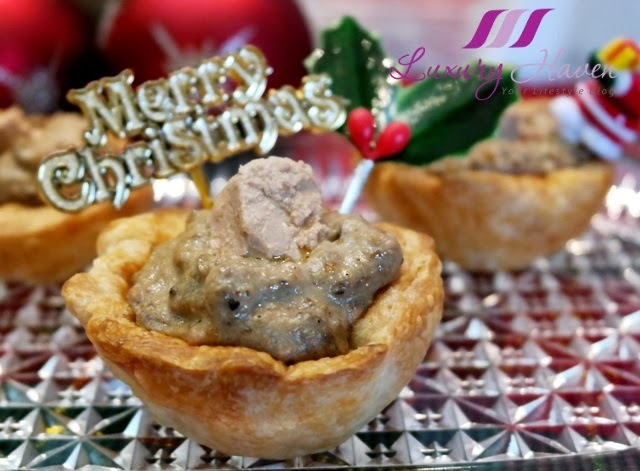 Few days later, I took them out to bake again, then cook the foie gras and mushroom fillings with Bulla cream, and voila, another beautiful dish - Foie Gras and Mushroom in Puff Pastry! Are you salivating already? I wanna try making the Wellington dish with other meat or seafood soon. Till then ......... HAPPY 2014!! Ken, so glad I didn't spoil my BFF's foie gras. Hahaha! Happy 2014! MM, Happy New Year to you too! Beautiful dish! Looks delicious too. I think for puff pastry, it always tends to broke when cut. 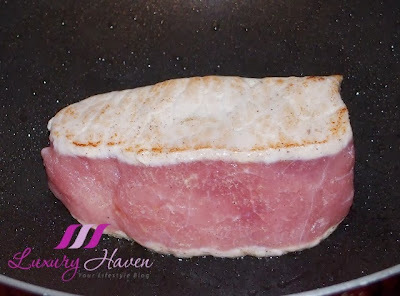 Perhaps you could make this dish in smaller pieces instead of 1 whole big piece, then you need not do any cutting, just serve it whole....what do you think? Hubby & I were also discussing that we should perhaps make small pastry rolls the next time. It's gonna be cute too. Thanks so much for your input! Hi Shirley, yet another yummy dish from you. Beautiful post ! A great start this new year ! All the best ! Rajiv, thanks for the wonderful note! Happy blogging! Wow it's awesome. You sure cook like a master chef. Not sure about the skin . Maybe hv to wash the whole area with egg white so that it would stick to the mushrooms mixture to make it harder to break when you cut. Kathy, I sure hope so. Lol! Point noted. Will try this out too. Thanks, dear! Ooo..how gorgeous this dish is - drool-icious! Do you think making small lines across the pastry before baking will help with the cutting? Sharon, will also take note of this. Thanks for the suggestion, & Happy New Year! Reana, hahaha! You're too humble, my dear. Shirley, happy new year 2014! SD, happy 2014 to you too! It's super duper. I am admiring the beautiful outcome. Can't comment on the taste though. Kylie, Happy New Year dear! I don't exactly know what a Wellington is, even though I've spent 2 years in NZ. >.<"
PH, guess I've to think about the next ingredient to use once I run out of foie gras. Heehee! Pepper, hahaha! Thanks sweetie, & Happy 2014! 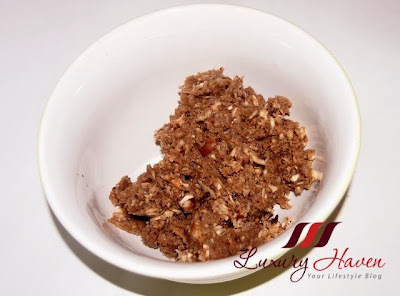 That is super delicious post of yours on 1st day of a new year! Lol! Rose, thanks for the awesome note! RJ, thanks so much for coming by & love having you around! Pls send me a pix if you do make it, & I'll post it up :) Happy 2014! Shirley you did an amazing job! I'm a huge fan of foie gras and the fact that used mushrooms which is so complementary with it and then pork! OOOo lala! I wish I had a 3 inch thick slice of that wellington! Amazing! Happy New year! Sharlynn, I somehow knew this recipe's gonna attract your attention. Lol! Thanks so much, sweetie! Happy New Year to you too! 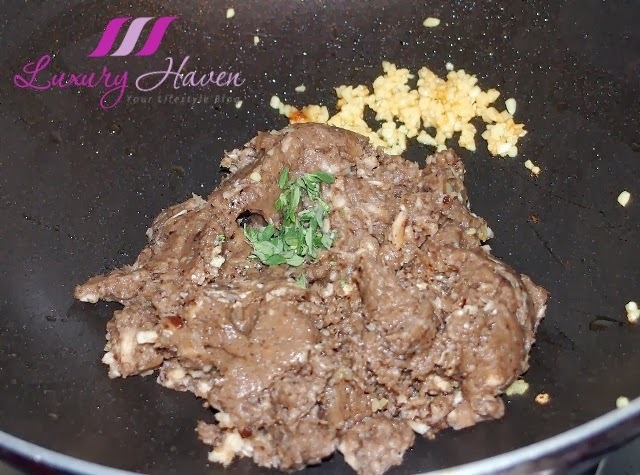 Shirley, you outdid yourself with this three-for-one recipe post! Mmmmm. Your friend must have been thrilled with the special dinner and I bet you enjoyed those last bites of Foie Gras when you made the pastry cups! 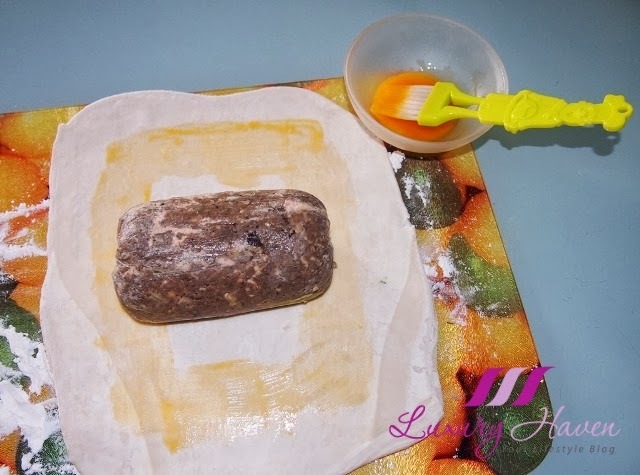 I've only made Beef Wellington with a "pie crust" type wrap, so I don't have any tips to offer on how to cut a puff pastry version. Yours was so beautifully presented, I'd just have everybody look at it for a couple of minutes before cutting it next time. :) I'm sure the flavor was sublime. Happy New Year! Kim, thanks so much for sharing your thoughts! I'll probably be doing mini portions for my guests next time & let them mess up the pies themselves. Hahaha! That way, I won't be the guilty one. Lol! Happy New Year, It looks so perfect and inviting. Subha, thanks & Happy New Year to you too! i give u 3 Michelin Stars. excellent presentation & wonderful receipe. JZ, thanks so much for the generous note! Happy New Year & hope to see more of you here! Awww..that required lots of technical skills here. Good job, Shirley! YL, I'm sure you've no problem achieving it! Happy 2014 to you too! TM, thanks dear! I love it too! I'm not much of a China explorer actually; I prefer cleaner places. But I can see you're really adventurous & enjoying a lot! Enjoy your vacation! Hong, it's nice! You really have to try it some day...... Happy New Year to you & family!